First Tomato of 2013 – Tomato Town organically grows heirloom tomatoes in the greater Kansas City area as well as Johnson County, Leawood, Lenexa, Olathe, Shawnee, Merriam KS, Independence MO and Kansas City Missouri, KCMO. Varieties include: Cherokee Purple, Brandywine, Stupice, Carbon, Black Krim, Black Cherry, Yellow Pear, Absinthe and Aunt Ruby’s German Green. Oh, the excitement is palpable. It is official, we’ve set a new record here in TomatoTown. June 25th is the absolute earliest we have had a ripe tomato. The variety is a Black Cherry tomato, a favorite. Despite its diminutive size it packs a wallop of flavor. In another first, this is the first time that a Black Cherry has produced the first ripe fruit. 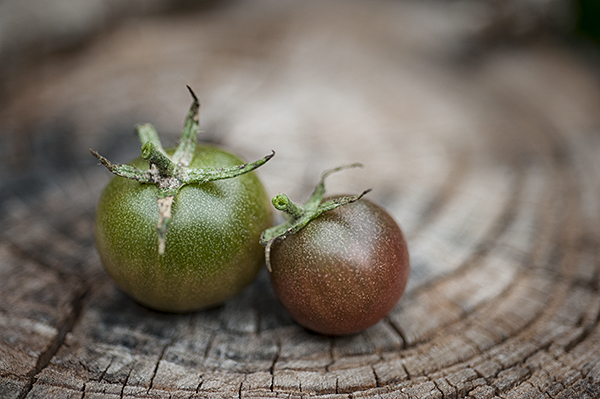 Two, count them, two ripe Black Cherry Tomatoes. This entry was posted on Tuesday, June 25th, 2013 at 4:59 pm. It is filed under Latest Posts. You can follow any responses to this entry through the RSS 2.0 feed.